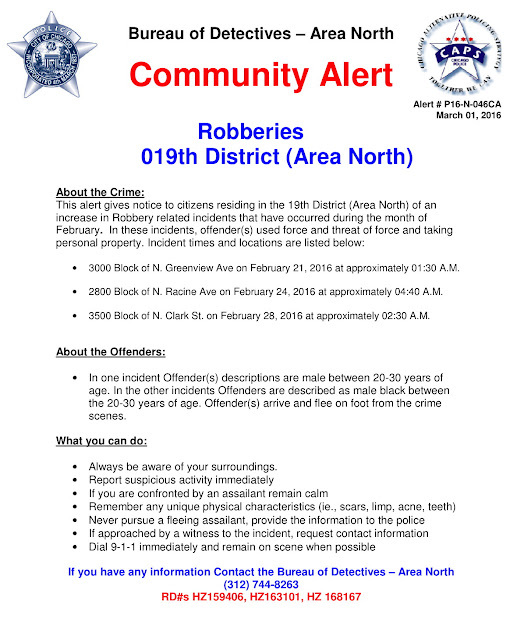 Area North detectives today issued the second community alert in a week for robberies in our area. The warning comes as both January and February recorded 100%+ increases in robberies compared to last year. 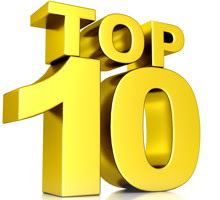 And, in an ominous sign, the police beat that covers the heart of Wrigleyville and Boystown—once infamous as the most robbery-plagued area in the entire city—returns to the top 10 robbery beats after a nearly yearlong absence. 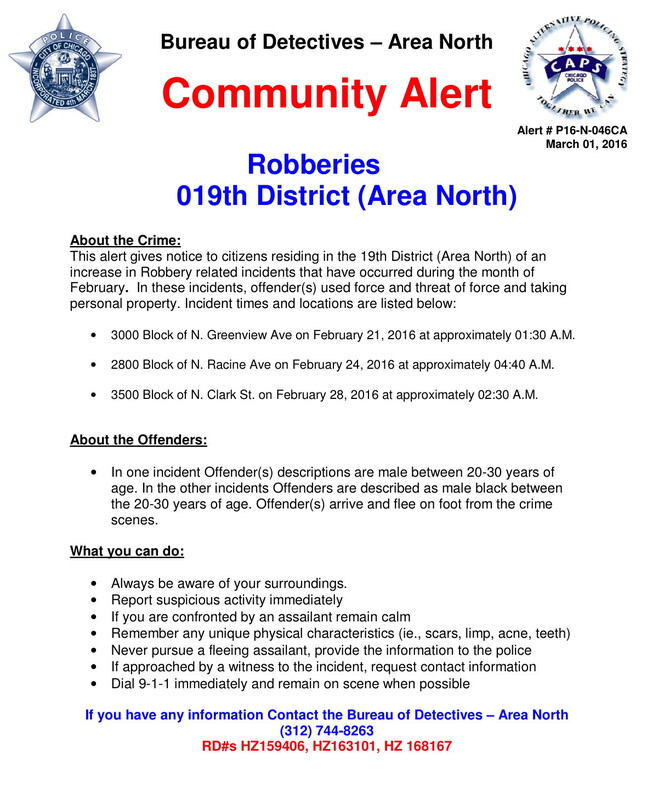 In the new warning, detectives connect three recent muggings that have similar characteristics: In the 3000 block of N. Greenview around 1:30AM on February 21; in the 2800 block of N. Racine around 4:40AM on February 24; and in the 3500 block of N. Clark at approximately 2:30AM on this past Sunday. At almost exactly the same time that the victim was robbed on Racine, a 19th district unit was dispatched to the same area after another robbery victim in the nearby 14th district reported that their phone was pinging from the intersection of Racine and Diversey, a source said. The two robberies are believed to be connected. And, as CWB reported on February 21, the Greenview victim told police that five men wearing ski masks and dressed in black clothing knocked her to the ground and took her purse and computer. The alert describes those offenders as "male between 20-30 years of age." The alert also offers a description from one of the other two incidents, but it does not specify which case: "male black between 20-30 years of age." The immediate Wrigleyville and Boystown area has recorded 28 robberies so far this year. The neighborhood had just 12 robberies during the same months last year as well as in 2014. It's the second-worst start to a year this millennium. Only 2013, which wound up being the worst year on record for robberies here, had a more violent start. Things have been particularly rough in Boystown lately as six of the neighborhood's last 10 hold-ups have been reported on the famed Halsted Street LGBT nightlife strip. The most recent robbery was actually reported inside of a bar on the 3500 block of Halsted at 4:45AM on February 21, according to police. The surge of robberies has sent local police beat 1924 rocketing back to the #9 spot on the list of most robbery-filled Chicago police patrol areas. Patrol beat 1924 covers the area between Halsted, Southport, Belmont, and Addison. The beat consistently ranked as the #1 worst area in the entire city for robberies in 2012 and 2013 as Wrigleyville and Boystown was overrun by three consecutive years of record high mugging rates. The beat dropped as low as #50 in robberies as Chicago police clamped down on muggings in 2014 and early 2015. There are 274 beats in the city. 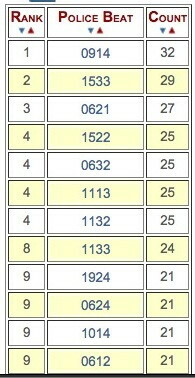 Among those currently rank higher than ours are parts of the Gresham, Austin, and North Lawndale neighborhoods. With old patterns now emerging, neighbors and business owners have every right to ask why.